At first it looks like any typical white ceramic mug. Look closely, and you will notice a decorative pull-downed zipper pattern on its side. I love it. 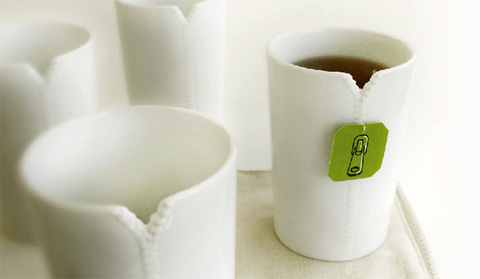 It’s whimsical yet with a purpose, serving as an opening to hold tea bags. 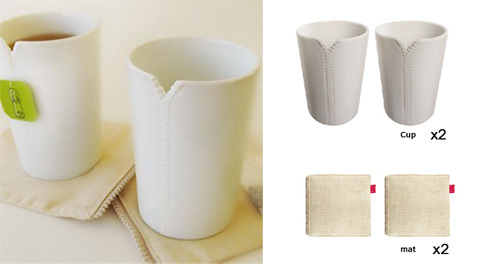 Each package includes 2 Ceramic cups and 2 fabric coasters, presented as a set inside an original gift box. This will make a great gift to newly weds, friends, parents, anniversaries – whatever the occasion, this elegantly designed set reflects the bonding and friendship of two people joined together.